Hydrogen is a leading contender for the energy source of the future. However, the technology behind its delivery and deployment is nowhere near consumer-level yet. Hydrogen-power scientists are still working out issues to make their solutions safer and more efficient. One of the factors holding hydrogen back is the puzzling inability to get the substance to stay in the storage media intended for it. While it has been established that palladium is probably the best compound for hydrogen storage, this substance's actual ability to retain these tiny molecules (i.e., H2) is sub-optimal. Pure palladium (Pd) attracts more H2 to its surface than other candidate storage media like gold. However, in order to store the hydrogen, it needs to sink deeper into the Pd’s surface. This process, known as chemisorption, followed by adsorption, has failed in recent studies. However, when tiny amounts of gold are involved in this Pd-H2 interface, the situation can be different. 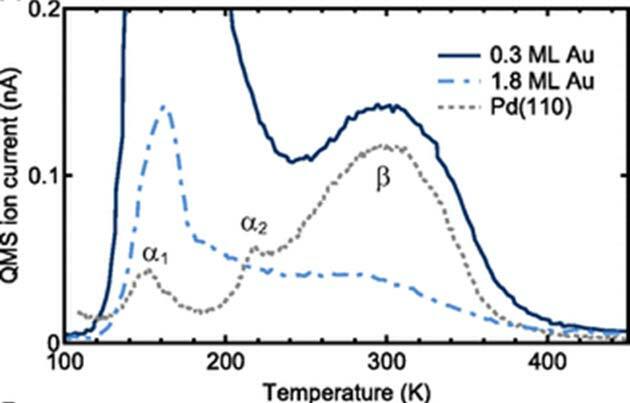 Some Pd-Au alloys have demonstrated significantly greater H2 absorption compared to Pd alone. This is because the ‘adsorption’ (or H2 retention) step within Pd-Au is superior compared to that for either of the pure metals. However, this is a finicky effect in need of extreme fine-tuning; add too much gold and the adsorption levels trend back toward those associated with Pd. The real problem there was that scientists did not know exactly why this happened. 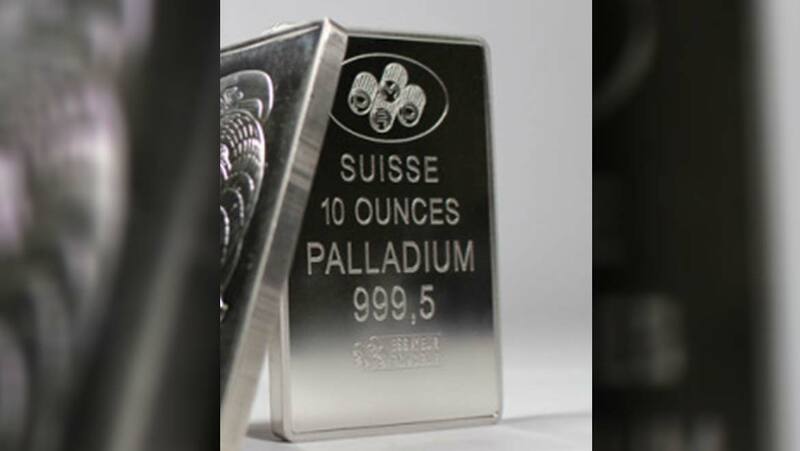 A newer study, led by researchers from the University of Tokyo, compared the hydrogen-retention properties of gold-palladium alloys with those of pure palladium. The alloys were prepared in the form of Pd surfaces at a nanometric scale. Just a few atoms were removed from the topmost layer of this surface and replaced with gold. This resulted in a sub-monolayer, in which the ratios of Pd to Au atoms were along the lines of 70:30 (i.e., an alloy with a 0.3 gold monolayer). 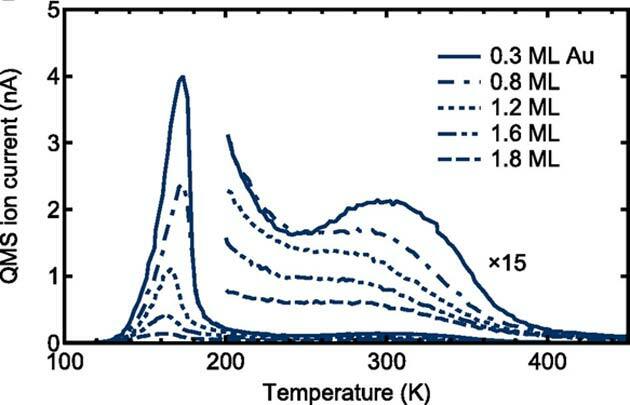 The scientists confirmed that this 0.3 alloy was superior in terms of adsorption compared to Pd alone, whereas their chemisorption profiles were virtually identical. These values were quantified using thermal desorption spectroscopy (TDS). They were taken in the presence of H2 bombardment (measured in units known as langmuir) of 100 to 1000 langmuir. The effect of the gold sub-monolayer on H2 retention can be explained by a number of factors, which the scientists also discussed in their paper. The researchers noted that adsorption depends on the electronics within the surface of the material in question. An angle-resolved photoemission spectroscopic (ARPES) analysis of pure Pd and a representative (0.48) Pd-Au surface revealed that Pd exhibited a solid band at 0.3 electron-volts (eV) below the Fermi line (E^F), whereas Pd-Au could achieve corresponding solid bands of up to 5eV. The alloy could also display additional intensities at up to 7eV. This broader range of electron energies was attributed to the properties of the gold in the alloy and may have been conferred by the s, d and p shells of its atoms. These findings led to the adoption of a 0.3 or 0.5 sub-layer conformation for the majority of the study. This also gave other results relating to the adsorption performance of the alloy. 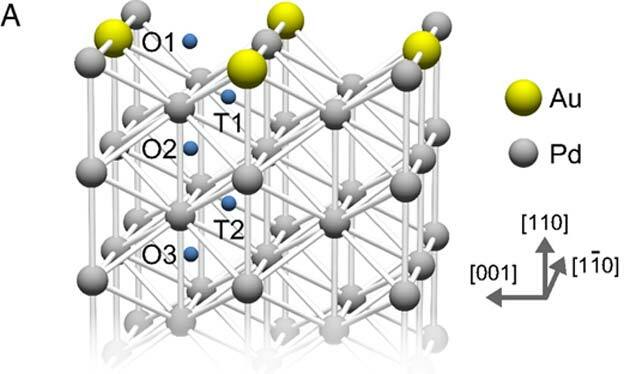 For example, the scientists reported that the intermittent inclusion of Au atoms into the top layer of the Pd surface exerted changes in the layers immediately below (which take the form of a lattice made of interleaving octahedral and tetrahedral layers of Pd atoms; therefore, the first layer is designated O1, the second T1, the third O2, and so on). This caused the electronic energy in the layers, and in the transitions (e.g., O1 to T1) to change. This energy is known as the 'penetration barrier,' as it partially prevents H2 adsorption past O1. Accordingly, the O1-to-O2 barrier in the 0.5 alloy was reduced by 0.16eV compared to that in pure Pd, as was the O1-to-T1 barrier (by 0.28eV). These values were measured using density-functional-theory (DFT) modeling. The results may also have helped to explain why too much gold disrupts adsorption; excessive disruption of the penetration barrier in this manner would have become too competitive with initial H2 chemisorption, and thus, discourage overall hydrogen storage. The scientists also conducted nuclear reaction analysis (NRA) on the 0.3 alloy and the pure Pd. This resulted in findings that the alloy exhibited relatively increased gamma-ray yield near its surface. This emission profile, indicating both H2 chemisorption and adsorption, was 4.5 times greater than that associated with pure Pd. The NRA analysis, additionally, suggested that the concentration of hydrogen in the first 5 nanometers of the alloy was 13%, compared to 4.2% for Pd. This suggested that the gold in the alloy significantly affected the hydrogen solubility of the underlying Pd. These results validated the effect of sub-monolayer alloying on the performance of Pd as a hydrogen-storage solution. Furthermore, this study has also helped scientists conclude that the effects are related to specific factors, which include differences in penetration-barrier energies and electron-energy profiles. The research may inform the hydrogen-storage technology of the future, and the role that metals, such as palladium, may take in its applications. K. Namba, et al. (2018) Acceleration of hydrogen absorption by palladium through surface alloying with gold. Proceedings of the National Academy of Sciences. S. Ogura, et al. (2013) Near-surface accumulation of hydrogen and CO blocking effects on a Pd–Au alloy. The Journal of Physical Chemistry C. 117:(18). pp.9366-9371.